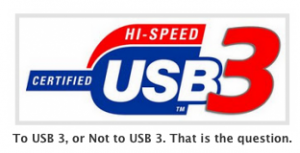 Back in September, I decided to see if USB 3 was worth my time and money. I installed a USB 3 PCI card (CalDigit SuperSpeed USB 3.0 Card – $79.00 USD) in my Mac Pro and set out to take a look at drives that offered USB 3 as an interface option. 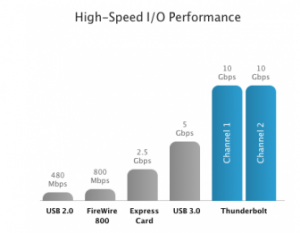 As you can see in this chart, USB 3 is advertised as being much faster than USB 2 or Firewire 800, but much slower than Thunderbolt. I do have a Thunderbolt port on my new Macbook Air but there are no drives out there yet, and there may not be any Thunderbolt drives for a while with the flooding in Thailand. Listen to Techfan Podcast #55 for more information. Speaking of Thunderbolt, MyMac Editor, John Nemerovski, has acquired a Thunderbolt Adapter from Seagate. Look for that review here at MyMac.com in the future. In my quest to understand if USB 3 lives up to the hype I had an opportunity to test three different drive enclosures. This is part 3. I was sent a USB 3 Card Reader recently. Expect a Part 4 review sometime in the near future. 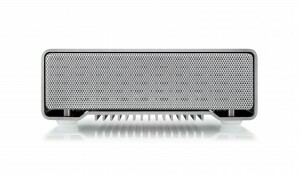 The Super S3 is an all aluminum enclosure with no internal fan. The unit remains cool because the enclosure itself acts as a giant heat sink. This seems to work quite well. Running the drive constantly for over an hour resulted in the enclosure feeling slightly warm to the touch. With no fan the enclosure is whisper quiet. Rubber feet prevent the drive from sliding around on your desk. 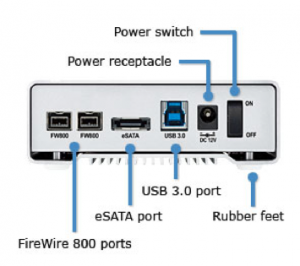 When looking at the back of the enclosure you can see it has two FW800 ports, one USB 3.0 port, and one eSATA port. Let’s talk about the speed. I copied a series of folders containing different kinds of files over to the Super S3 and used a stopwatch to discover which port was fastest. In Part 2 the enclosure I tested had a solid state internal drive and it was very fast since these drive mechanisms have no internal moving parts. While the Super S3 was very fast it was not quite as fast as that drive. However, the speed of this drive, which uses conventional HDDs (Hard Disk Drives) that are still much cheaper than SSD drives, is quite impressive. The size of the internal drive can be much larger with a HDD than an SSD. I think this is a huge advantage for the Super S3. I realize that this is not a scientific test, but I think it represents what you and I will see out here in the real world. However, what I did find interesting is how close FW 800 came to the the USB 3 speed. FW 800 is an interface most of us already have. The enclosure comes packaged with all of the cables you will need to hook up to any interface, eSATA, USB 3, or Firewire 800. The unit also comes with an AC adapter which is much smaller than the power bricks we are used to seeing with full size drives. When the drive is active there is a blue LED indicator flashing. What is interesting is where that LED is located. It is on the top of the unit in the far back just above the FW 800 ports. Akitio describes these enclosures as “stackable” which they are but stacking them on top of each other will certainly obscure the LED activity indicator. 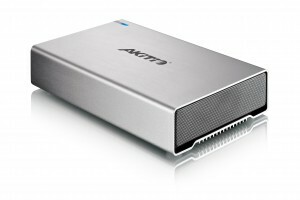 The drive dimensions are 8.7 inches X 4.5 inches x 1.5 inches. In conclusion, this is one of the fastest external drive enclosures using conventional HDDs I have ever used. It is very quiet and looks good next to my MacPro. It also comes in a dark metal enclosure. You want one of these!